I didn’t realize that AASHTO is published by Toole. Aren’t they pretty opposed to this bike stuff? Toole wrote the MassDOT guide and that one is just about the best that exists this side of the Atlantic. Unfortunately, since it’s only a state-level document, most practitioners not in MA wouldn’t be very keen on using it. Having it at the AASHTO level means that it can be used nationwide without any hesitation. Why would the MUTCD need to bless the idea of a protected intersection or a separated bike lane? Since when are these things that require FHWA Experimentation? The MUTCD may need to prescribe how to mark, sign, and/or signalize a PI or SBL, but it shouldn’t be the arbiter of the ability to implement one. The current AASHTO manual does not include separated bike lanes, but it doesn’t specifically prohibit them, nor should engineer’s use that as a reason to discount them. There are other manuals out there that cover separated bike facilities, such as the NACTO bicycle design guide, and the Federal Highway Administration Separated Bicycle Facility Guide (yes, a Federally endorsed guide!). It is good AASHTO is updating, but perhaps also good that they stayed out of the way while more bike/ped minded groups developed the nuts and bolts. The FHWA MUTCD is probably more important legally in what definitively can or cannot go on a roadway, and is definitely due for an update with all the bicycle infrastructure developments that have happened in the past decade. Similarly though, the MUTCD doesn’t have anything that specifically excludes separated facilities that I am aware of, but would only prohibit experimental lane markings that may be associated with them. I believe you’re right. MUTCD covers traffic control devices (pavement markings, signage, etc). MUTCD can only get in the way of the how a separated bike lane is marked, but doesn’t have any weight on the actual positioning and separation of the bike lane. A merging/mixing zone? You mean that thing drivers try to run me down in every time I encounter one? The merge zones have the same conflict but with much worse sight lines since the two streams are basically parallel at the conflict point. I’d rather deal with a merging driver than one turning across my path. Merging allows for more reaction time, on my part, along with more space to slow down / stop, and avoid impact. There will always be clueless / distracted / idiot drivers. My goal is self preservation. Either way, if there’s a vehicle next to me, and I’m in their blind spot, I’m either slowing down or speeding up for an intersection. Assuming both vehicles are going the same speed, having one turn across the path of the other is just asking for crashes. Merging may not work well for Type A, me-first personalities, but for everyone else, it reduces the potential for serious injury. In the “protection intersections” image, the left panel shows what is a very standard intersection design in the Netherlands. The cycle track bends outwards to create an area with enough room for a vehicle to wait to turn (if the intersection is not phase-separated). If built correctly, the almost-right angle turn would greatly slow the motorist down and the sight lines are also improved because the car is perpendicular to the cycle track. Intersections are always more problematic because you have different modes crossing each others’ paths and so care must be taken into the planning and design. Dutch engineers are incredibly meticulous about studying their designs, so if something is shown to be problematic, they would be very quick to making improvements. As an American living in the Netherlands, I’m always impressed at how much better and more quickly infrastructural projects are handled here compared to the States. The impressive quality of the construction, and subsequent upkeep, of their roads really leaves something to be desired in the US. And they are always continually improving sections that are less than ideal in their towns and cities. And I think this all mainly comes down to proper design and policy for the Dutch. They didn’t accidentally end up with the infrastructure that they have today, and neither is this a “Europe” or even a “Northern European” thing. As soon as you cross over to Belgium, the road quality, design, (lack of) maintenance and just the whole network in general is so obviously inferior in every way possible. It’s incredible to me how two neighboring countries of similar size can be so different. Those “slot” and merge configurations are horrible. You just get right hooked in the merge rather than at a corner. I’d much rather be adjacent to the sidewalk than trapped between two motor vehicles while waiting for the light to change. It depends, greatly, if the vehicles are stationary or moving at 15-20-25 mph. Merging with vehicles in their blind spot is inherently dangerous. Blind spot mixing zones are not only more dangerous, they take up much more space and cost much more money to build than a protected intersection. More dangerous, more expensive, more confusing for cyclist wanting to turn right. Why should cyclists turning right on a bike lane to another bike lane have to merge blindly with vehicles in a confusing intersection that costs twice as much to build? aren’t these trees on the wrong side of the bike path? Wow, that has not been my experience at all. Drivers cruise through the mixing zones here in SF at full speed before they slow to make their turns, and because their cruising speed is two or three times mine, I don’t see them coming. When our paths cross after their turn I can at least see them coming— they’re already in front of me— AND they’re going much slower. Having experienced both types of designs, I’m all about protected intersections. I can’t imagine a 10 year old on a bicycle sitting in that unprotected lane surrounded by large cars or trucks. I completely agree. By keeping to one consistent design, the Dutch standards are the best. Starting from the right side of the street and moving left, the order is: sidewalk, bike lane, parking lane (if provided), and car lane. Going through intersections, the order of the lanes does not ever change. Drivers turning right have to look out for cyclists going straight, but this is not an issue as the bike lanes are so prominently marked and since drivers have become so accustomed to having to yield to cyclists. Further, drivers also have to yield to people walking straight through an intersection, so it is not an unusual concept for motorists to have to look out for traffic on the right-hand side of the vehicle when turning right. I love how the idea of a protected bike lane is seen as hypermodern or a product of the 21st century. I first saw them in 1980 backpacking in Europe. Having one vehicle turn across the path of another is precisely what happens in “merge zones”. The Dutch design enforces a slow turn on the part of the motorist, so they’re generally not going the same speed at all. That’s the weak treatment that this is trying to solve. Updating AASHTO solves part of the problem. Another issue is outdated, auto-oriented local and state street regulations mandated by ordinances. These regulations are stubborn, infrequently updated and often remain in place even after locally adopted complete streets policies are approved. As you and Chris (below) note, the specific markings are subject to MUTCD governance, but the fundamental design issues are not. The MUTCD is NOT a design manual. It standardizes the use of signs, signals, and pavement markings. 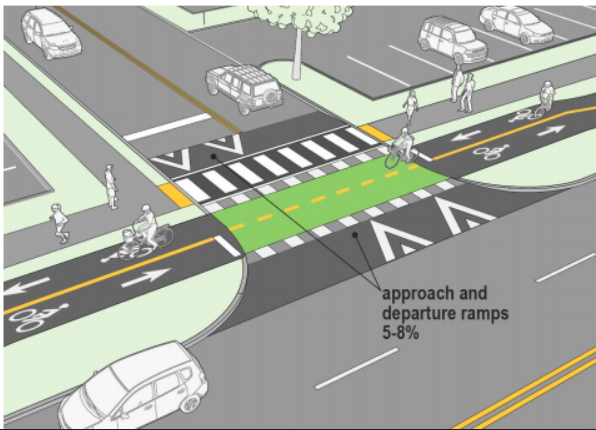 So something like a turn box, which could be used in conjunction with a separated bike lane, would be governed by the MUTCD and is considered experimental. The point is to study the understanding and effectiveness of markings before making them permanent in the manual. It is easy to get permission for use of all of the different “experimental” TCDs used in separated bike lanes. A notable point is that the Dutch “protected” intersection isn’t ubiquitous. In city centers with less space they often don’t exist due to the amount of right of way needed. It is one of the main challenges in implementing them on US city streets with constrained space, especially older cities that don’t have big, wide, multi-lane streets in their urban core. AASHTO isn’t published by Toole. TDG was selected to prepare the updates to the manual, just as they were selected to make the updates to the AASHTO ped guide, and previous updates to the bike design guide. I love the protected intersection and the marking for the bike crossing. Can you share the link to the draft document ? We don’t actually have the draft document, unfortunately. It hasn’t been released. This report was just based on a presentation from Toole Design about it. The Vision Zero Initiative seeks to reduce traffic deaths to zero–certainly a worthy goal. However, I looked throughout its web site and couldn’t find anything about how they propose to achieve that goal. Instead, there is a lot of mumbo jumbo along with a few poorly chosen statistics about how safe roads are in Sweden. The lack of specific recommendations combined with the misuse of data leads me to believe that this initiative is no better than a cult trying to get money out of gullible government officials with the promise that, if they pay enough, they’ll get a magic formula to safer streets. The statistic they most commonly use is number of traffic deaths per 100,000 residents. The problem with this is that this number is bound to be higher in countries where people drive the most. Considering that commercial fishing is one of the most dangerous jobs in the world, you could just as well argue that countries that have totally destroyed their fisheries due to overfishing have superior policies to ones that still have healthy fisheries. However, there are better ways of improving safety than destroying the utility of whatever it is that might be dangerous. Only by searching other web sites, including Wikipedia, do we learn Vision Zero’s secret: they make streets safer by slowing traffic down to a crawl. In other words, they greatly reduce the utility of the automobile. We know from various research that slower speeds means lower economic productivity. Yet there are better ways of making streets safer without reducing people’s mobility and income. The Vision Zero people brag that, since adopting the policy in 1997, fatality rates in Sweden have dramatically declined. Yet, in that same period, U.S. fatality rates per billion vehicle miles (a better measure than per 100,000 residents) declined by more than a third. Far from being some new Swedish discovery, safety has, in fact, been a high priority for traffic engineers ever since the profession began. Fatality rates in the United States fell by 50 percent between 1910 and 1922; another 50 percent by 1939; another 50 percent by 1958; another 50 percent by 1986; another 50 percent by 2008; and 15 percent more since then. There are many reasons for this steady decline, but slowing down traffic isn’t one of them. Instead, the reduction in fatalities is mainly attributable to safer road and automobile designs. There are many cases where faster is actually safer. The safest roads in our cities are the interstate freeways (4.1 deaths per billion vehicle miles), followed closely by other freeways (4.7), while the most dangerous are local streets where traffic is slowest (11.3). Despite faster average speeds, one-way streets are safer than two-way, even for pedestrians. Contrary to the hoopla, even slowing down cars is not going to reduce traffic deaths to zero unless, of course, cities reduce speed limits to zero. But the real point of the “Vision Zero” name is not to set a realistic goal but to silence potential opponents: “If you are not for Vision Zero, you must want to see people die in traffic.” While there’s nothing wrong with seeking to make roads safer, there is something wrong with following a cult that treats its prescription as a religious dogma and demonizes anyone who disagrees. Despite the questionable assumptions, the Vision Zero cult has attracted a lot of followers. Portland has joined, of course. So has Boston, Chicago, Los Angeles, New York, San Francisco, Seattle, and Washington. Officials in many of these cities spout off about the zero-fatality goal without mentioning that this goal is unattainable and the real effect of their policies will be to reduce people’s mobility. Let’s make roads safer. But let’s do it cost-effectively in a way that doesn’t reduce mobility. Bi-directional “cycletracks” undo the work of 40 years of training ‘salmon’ cyclists not to ride against traffic in the mistaken belief that they will be safer, because they can see motorists coming. They not only endanger other cyclists, but are most at risk of being creamed by motorists who are only looking for oncoming traffic. These expensive “solutions” to bicycle safety instead of education, training and calming traffic to slow vehicles down, basically mean fewer miles of bike facilities will be built, because funding will be the limiting factor, not design standards. They are not, because bikes and cars have to have mutual visibility especially when it comes to turns. I mostly agree, but there are rare, isolated instances where it makes sense to have them, e.g., between a shoreline/riverfront park & adjacent road. Certainly they have no place in an urban grid. In 20 years they will be, but until their replacements grow, no sense in chopping down existing trees. Is the final image meant to illustrate the driveways referred to in the text? If so, that’s a big road-sized entrance to a commercial development, not the small residential driveway I was expecting. How are those handled in the manual? Regardless, I’m all for highlighting bike lanes with green where necessary, but don’t understand the use of solid green. The motorway design language I’ve come to expect is that dashed paint = crossing. Dashed yellow center strip means cars can cross into oncoming travel lanes. Dashed white/yellow bars at intersections means pedestrian crossing with right of way. Dashed green bars through an intersection means bike crossing with right of way. To keep the design language consisten & unambiguous, solid green should be reserved for non-crossing situations like forward starts, turn boxes, and the start/end of exclusive bike zones. definitely recreational paths like old railroad tracks turned into cycletracks are great. Your championing of bicycle viaducts is a valid option too. So many motorists want cyclists to be segregated because they don’t know how to pass them safely, but unless massive amounts of funding goes into bicycle and pedestrian facilities, most will have to share the roads with distracted, impaired and aggressive motorists. Agree. We see lots of salmon here and even though we are going to do a series on driver/cyclist education, we know that all the learning in the world will not get to those types of people who are guilty of it. They are just oblivious! It does not really need more space than if you didn’t have the separation islands at the junctions. But if space is very limited, you do sometimes see smaller versions of these intersections. There will be less space overall, including the “waiting area” for cars to turn right, across the bike path. They actually think they are safer because they can see oncoming vehicles, not realizing that the intersecting vehicles that don’t see them are going to prove them wrong. Besides it’s freaky to see cars coming at you, while riding with traffic at least allows a level of obliviousness, although I did use a mirror. And I’ve been hit from behind, but still wouldn’t want to see them coming at me. They make sense on one-way streets in certain instances. Over 40 years ago, it was identified in the 1978 Cross study that most salmon cyclists do know that riding against traffic is illegal, but do it anyway due to the convenience factor. Since that time, a LOT of development has occurred and generally created more of the type of environment which leads people to salmon (e.g. long blocks, wide roads). Since they’re going to salmon anyway, there is some benefit to at least designing the infrastructure with that expectation in mind and taking the appropriate measures to minimize the risks. 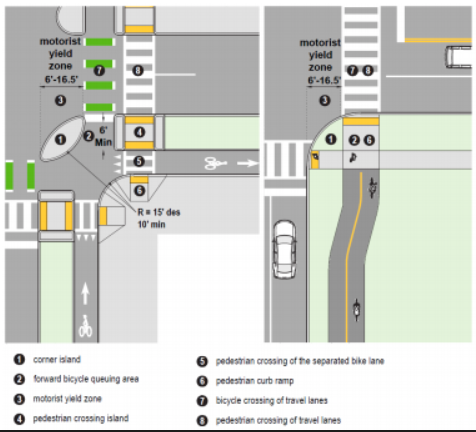 It’s being written by the same consultant that wrote the MassDOT Separated Bike Lane Planning & Design Guide and the pictures above look pretty similar, so I expect it to ultimately look close to that document. If you’re unfamiliar with it, follow the link below and take a peek. I don’t disagree when talking about optimal situations where the space exists to put the appropriate separation between the roadway and the bikeway, but many places don’t have that much space available (actually, they’re still gripped by car supremacy but I digress) and AASHTO manual currently cautions against stuff that’s popular such as bollards in a bike lane buffer. City center locations with less space very often don’t have a separated bikeway in the first place. Instead, the Dutch just greatly restrict the cars and design the area for human-scale travel with motor vehicles de-emphasized. The biggest difference between the two is that the sight lines of merging are atrocious compared to the sight lines of a perpendicular crossing. To be fair, a decent protected intersection can be quite expensive compared to just ending the bikeway and putting down some stripes. But that’s only an illusion, especially since it will hamper usability by the masses and thus thwart the potential value of the project. Actually, as Berkeley recently discovered, protected bicycle intersections are cheaper than conventional bulb-outs because they don’t require any expensive subsurface drainage. Protected bicycle intersections consist of a refuge island made of cement, market posts, signage and paint. Most of the time expense is in the design not in the actually construction. The traffic signal is the most expensive element of this, and i seriously doubt a protected intersection traffic signal would be significantly more expensive than an unprotected one. If the street is being resurfaced anyway or if it’s a new road, I can’t see how protected intersections would be any more expensive. But the cost savings from the reduction of preventable deaths and permanent injuries would make protected intersections cheaper than the more dangerous unprotected ones we have now. Good points, that was a ground breaking study, but knowing that it is illegal doesn’t mean they know why it’s particularly unsafe or where to be most observant and defensive. Usually there’s not enough time to act defensively and drivers are on autopilot. Only experience teaches most cyclists how to reduce their risks, because our training of bicycle use is like that of a toy, not transport. I’ve salmoned at times because of road design and traffic conditions, but wouldn’t want to condition riders to do this as a matter of course, because familiarity reduces defensive awareness.